Chicken in Tarragon is one of those classic dishes which is so simple to make and yet can easily pass as an elegant dinner recipe due to its creamy texture and sophisticated flavour. Tarragon is a green herb with narrow leaves and a slightly aniseed-like savoury flavour. It goes well with chicken and fish and can also be used to flavour butters, sauces and salads. There are two main types of tarragon: Russian tarragon which has shorter leaves and a ‘rougher’ taste and French tarragon which has longer, more slender leaves and a more delicate flavour. 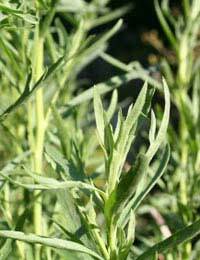 It is French tarragon which is used in cooking and is also one of the main ingredients in fine herb selections. If it is possible to buy fresh tarragon, this is much nicer to use, both in terms of flavour and garnish (most supermarkets sell it now), but otherwise dried tarragon will still give the distinctive aromatic flavour of this dish. For this dish, the white meat of chicken works best. Either whole chicken breasts (with skins removed) can be cooked and served as individual portions, or the breast can be cut into strips, in which case the total cooking time can be reduced by about half. If using frozen chicken, it will need to be thoroughly thawed and brought up to room temperature before cooking, to ensure that any potentially harmful bacteria are destroyed in cooking. The following ingredients are for 4 people, allowing one chicken breast per person, but amounts can be easily adapted for more or less people by adding or subtracting as needed. Take the onion, chop finely and cook on a low heat in half the butter until soft and golden. When ready, add 2 level teaspoons of mustard, stir into the onions (add more or less according to personal taste) and move to one side of the pan. Next, gently cook the chicken breasts in the remaining butter, turning once until nicely golden-coloured on both sides. Place a lid over the pan and continue cooking until tender and cooked all the way through (they will need about 20 minutes). If drying out, a little of the wine can be added at this stage. When cooked through to the centre, turn down the heat and add the cream, the rest of the wine (if used), cheese and tarragon. Stir gently taking care not to allow the cream to boil; it just needs to heat through. Grind some fresh black pepper into the dish and salt to taste. Serve at once with rice, fresh greens and a little fresh tarragon to garnish. This recipe can also be adapted to using fish instead of chicken. Any boned white fish works well, but of course the cooking time will be reduced to about 10 minutes. A few capers can be added as extra flavour to the dish too. For vegetarians, in lieu of meat, soft-boiled or poached eggs can be served with the tarragon wine and cream sauce or for vegans, mushrooms lend themselves well to this flavour combination and other vegetables such as peppers or cauliflower can be added if desired. A little lemon rind cooked with the vegetables can also add an extra subtle flavour which blends nicely with the tarragon. For those watching their weight or their fat intake, a low-fat version of the dish can be made quite easily and which tastes just as creamy. Instead of frying the chicken in butter or oil, it can be poached in the wine and kept warm on a plate placed over a pan of just simmering water whilst the sauce is made. To make the tarragon sauce, it is possible to substitute the cream for crème fraiche, which still has a thick, satisfying consistency but a slightly ‘sharper’ taste, or a more cheesy cream sauce can be made by buying a low-fat cream cheese such as Philadelphia, heating very gently and stirring in some low or even non-fat milk to thin down the consistency slightly. Then, instead of completely covering the chicken in the sauce, serve separately and pour over the chicken, in this way using less sauce. Just as good in winter or summer, Tarragon Chicken is an easy dinner recipe which can be made quickly and simply, yet tastes absolutely delicious.